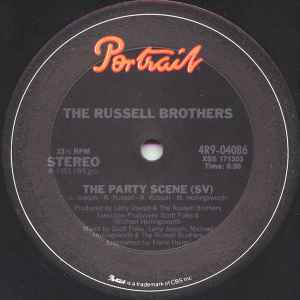 What ever happened to the Russell Brothers? one of the most iconic records of its time. I have an original '83 pressing of this. It was in heavy rotation when I was in college during the 80s and a lot of the fraternities would "step" to this during parties. Kind of an interesting meld between "electro," "funk," and "R&B" with rap vocals to top it off, but from a BPM perspective certainly not as fast as what we would typically associate with "electro" music. I'd strongly suggest adding this to a collection. Nice to see this one back in press again (ok, it's from 2012, I'm a bit late in noticing it). One of the greatest diamonds in the early '80s electro-funk/ proto-hip-hop canon. Most people would have come to this from the 1984 Streetsounds compilation Crucial Electro 2 (a fantastic selection for the time in which classics like Planet Rock, On the Upside and Two, Three, Break kind of over-shadowed The Russell Brothers, at least that's what happened to me... it took a while before I realised the brilliance of the track). Unfortunately the mixing into The Party Scene on Crucial Electro 2 is a messy affair with terrible scratching performed by DJ Hamfisted. Anyway - when you get into it - there's a fabulous urgency to the amazingly syncopated vocals, they grip you from the beginning, pushing the rhythm on. Offbeat synthetic effects add to the excitement. If this track had some sort of 'message' to it.... some sort of political or social theme... or maybe some sort of space-age science fiction concept like a lot of the other electro tunes... then I think it would be better remembered. As it is - it's simply one of thee greatest party funk anthems - nothing wrong with that at all. I've always wondered why it wasn't re-released!! It should be. Has it'll give a younger generation a chance to experience the good ole days..
Then again, you'll get people moaning about de-valuing there originals..